Hi Wade, had my hopes up till I saw this about the cap. Ours is a brown Sanibel 2014. 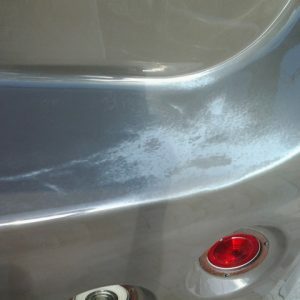 Oxidation going on on top of cap and on the back kick out area under the back window. Lovely chalking going on. I was just about ready to order the Rejuvenator. Would this work a little while? Suggestions are welcome for both my issues. 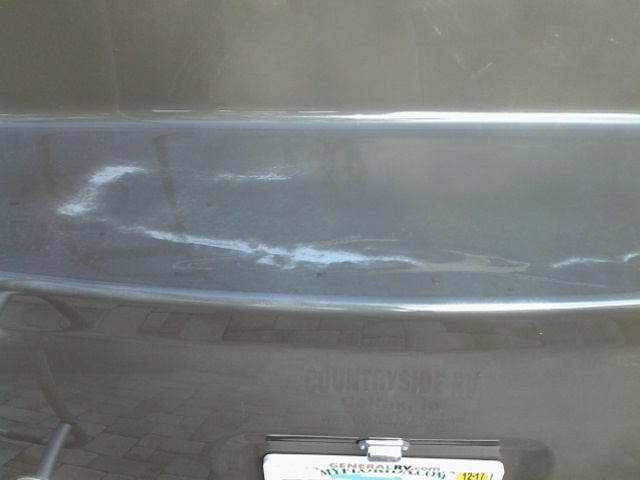 Attached is a couple pictures of the kick out on the back of our 2014 Sanibel. The sun hinders a cap picture but it is the same starting at the top and just beginning it’s path down the front. I appreciate your quick response and your honesty regarding my inquiry. For the thousands of owners of these units issues don’t stop with the exterior. Th e bonded leather furniture separates in bubbles then sheds like a bad sunburn. No help from any of those involved from the manufacturer down the line. Wish there was a class action suit but none yet. These units sell in the high $$ range that represents a costly investment in correctable issues that they certainly were aware of. Thanks for the photos. Your gold areas are painted not color infused. What you see is the clear coat starting to flake off. This is a common problem in sunny areas. The only way to fully fix this issue is to have the area repainted. The cheaper, but temporary fix would be to wet sand and repaint with a matching spray paint but this is a tricky task and requires a touch of artistic skill mixed with mechanical prowess. I share in your opinion that it is unfortunate to have to deal with these issues after making such a large investment. So much so I created Duratain Protective Coatings just for this very reason. I’m sorry I can’t be of more help here!